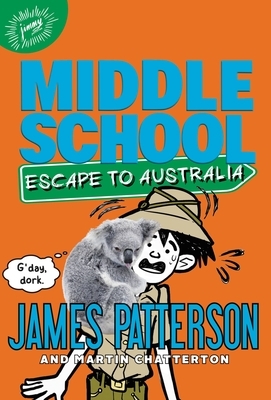 In this adventurous installment of James Patterson's bestselling Middle School series, everyone's favorite underdog hero Rafe Khatchadorian is headed to the dangerous wilds of Australia! Rafe isn't exactly considered a winner in Hills Village Middle School to say the least, but everything's about to change: he's won a school-wide art competition, and the fabulous prize is getting to jet off to Australia for a whirlwind adventure! But Rafe soon finds that living in the Land Down Under is harder than he could've ever imagined: his host-siblings are anything but welcoming, the burning temperatures are torturous, and poisonous critters are ready to sting or eat him at every step. So with the help of some new misfit friends, Rafe sets out to show everyone what he does best: create utter mayhem! James Patterson received the Literarian Award for Outstanding Service to the American Literary Community at the 2015 National Book Awards. He holds the Guinness World Record for the most #1 New York Times bestsellers, including Middle School and I Funny, and his books have sold more than 325 million copies worldwide. A tireless champion of the power of books and reading, Patterson created a children's book imprint, JIMMY Patterson, whose mission is simple: "We want every kid who finishes a JIMMY Book to say, 'PLEASE GIVE ME ANOTHER BOOK.'" He has donated more than one million books to students and soldiers and funds over four hundred Teacher Education Scholarships at twenty-four colleges and universities. He has also donated millions to independent bookstores and school libraries. Patterson invests his proceeds from the sales of JIMMY Patterson Books in pro-reading initiatives. Martin Chatterton was born in Liverpool, England and has been successfully writing and illustrating books for almost thirty years. He has written dozens of children's books and illustrated many more for other writers, including several British Children's Laureates. His work has been published in fourteen languages and has won and been shortlisted in numerous awards in the UK, US, and Australia. Alongside writing for children, Martin writes crime fiction (as Ed Chatterton), continues to work as a graphic designer, and is currently working on his PhD. After time spent in the US, Martin now divides his time between Australia and the UK. Daniel Griffo was always drawn towards creating and drawing images. In his teens, he became a self-taught comic illustrator and worked for both Argentinean and Italian publishers. As a freelance illustrator, Daniel has worked for many large companies including Image Comics, Warner, and Scholastic. He currently resides in Argentina with his wife and children.